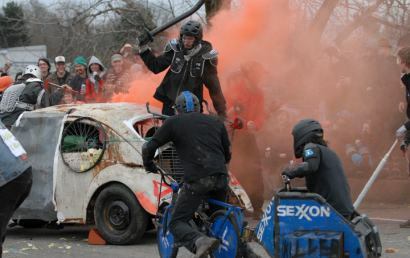 The Ben Hurt Chariot Wars were held Saturday in North Portland. 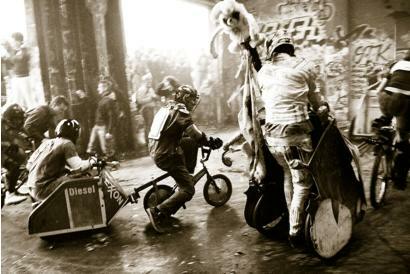 A weekend-long festival of mini bike fun and carnage. You zoobomb until you can’t any more. A one hour workshop to learn the rules of the road, traffic dynamics and essential bike handling techniques. A great first step towards bike commuting, as well as a way for intermediate commuters to learn more and share what they know. Led by Evan Ross, of Portland Bicycle Tours. Hosted by the Bike Farm, a local non-profit, bicycle tool library and learning resource. Free. 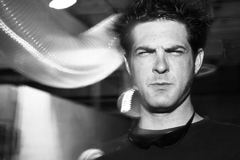 Late Monday night, a house fire in Southwest Portland claimed the life of Cody Reuwsaat. The Ben Hurt Chariot Wars were one of many highlights at Mini Bike Winter V.
Mini-Bike Winter got off to an explosive start last night when a parade of nearly 150 brightly lit bikers — including several dozen visitors from Canada, Seattle and California, and quite a few first-time bombers — zigzagged on the Lit Ride from the NE Alberta arts district to the Zoobomb pile downtown. 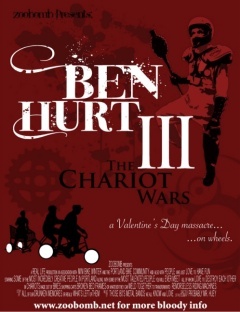 New to Zoobomb’s Mini-Bike Winter this year are the much-anticipated Chariot Wars (yes chariots, as in Ben Hur). To help ready the masses for this series of competitions a chariot building workshop was held over the weekend. Attendees were given a handout that covered all the various design and welding issues one might face when constructing a chariot. Portland’s mini-bike enthusiasts (a.k.a. 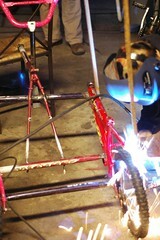 the Zoobombers) are busy planning their biggest and baddest ever Mini Bike Winter. The event, a “bike-centric series of events celebrating human powered culture,” will take place February 17-19th. I attended a recent planning meeting to get the lowdown and now I understand what one Zoobomber meant when he said they are, “practically vibrating with excitement” over this event.